After some decades of incremental progress following the end of the Cold War, there is doubt over the future of Europe, illustrated most dramatically by the rise of ethnocentric political parties in a number of European nation-states, and the "Brexit" referendum of 2016. To understand this current situation and examination of the context of Europe is necessary, and how European unity has threatened traditional superpowers in such a way that it is in their interest to weaken this unity. For those whose political allegiance is towards individual liberties and social democracy, the fate of Europe is critical, as this is the region which has shown greatest commitment to these ideals. Some Eurocentrism is justified, as the European peninsula of the Eurasian continental plate is central to modern world history, that is c1500 onwards. Prior to that traditional civilisations such as that of the Chinese or Arabic societies were well in advance of Europe. However, after this point, there were dramatic changes in Europe that continue to influence us today. It is from Europe that global imperialism was initiated, along with the colonisation of the Americas and Oceania. It is from Europe that the industrial revolution was initiated, with the resulting explosion of modern technologies, population, and resource use. It is from Europe that we witness the religious wars, the rise of secularism, the enlightenment, and the scientific worldview. It is from Europe that the ideologies and revolutions of liberalism and socialism began, and eventually and the two world wars of the 20th century. Today Europe has one of the highest levels of GDP per capita (behind Oceania and North America), covering a mere 7% of land area, 11% of world population, and 33% of the world economy. The causes for this are subject to debate. The perspective from Marx is that was due to changes in the mode of production, that union of the means of production and the social relations of production; "The history of all hitherto existing society is the history of class struggles". In contrast, Weber concentrated on worldview orientations, and the rise of rationalisation whereby the Judeo-Christian emphasis on moral mastery combined with the Hellenic deductive method over nature, leading to positivism. In a more contemporary sense, Diamond makes the argument that it was the physical geography and climate that led to the changes, arguing a Goldilocks scenario where European nation-states were just large enough to develop sufficiency, with enough geological borders, and just small enough to be in competition. My own perspective is that modernity was spurred by the rise of communications technology - the printing press in particular. The combination of an alphabetic script with movable type allowed for the generation of mass communication between scholars along the ideas of heresy and insurgency. It is worth noting that in the first one hundred years after the European printing press more books were published than the entirety of previous world history, along with Protestant reformation and all that followed. The contemporary political situation in Europe can be described as the rise of the European Union as an emergent complex superpower, and in some conflict with older power structures from the Cold War era. Following the end of WWII Europe was primarily split into the eastern (Warsaw Pact) and western (NATO) antagonists, with the political allies in the latter helped by the Marshall Plan. There were some neutral countries, and difficulties within the pacts. NATO included the fascist government of Portugal (Spain joined after Franco), France has its own military control. In the Warsaw Pact there was reform communist governments, and suppressed revolts in Hungary in 1956 and Czechoslovakia in 1968, along with Albania siding with China in 1960. Whilst most of the neutral countries were western-aligned (Ireland, Sweden, Austria), Finland and Yugoslavia remained unaligned. The collapse of the Warsaw Pact and the communist regimes from 1989-1991 fundamentally changed the political landscape; NATO expanded to incorporate the reunified Germany, Poland, Hungary, the Czech and Slovak Republics, the Baltic states, Bulgaria, Romania, Slovenia, Croatia, Albania, and most recently Montenegro. Notably at the time clear indications were given to the Soviet Union that NATO would not expand eastwards after German reunification. It is also notable that NATO carried out no military operations during the Cold War; since then it has engaged in operations in Bosnia and Herzegovina, Kosovo, Afghanistan, the Gulf of Aden, and Libya. Parallel to development of NATO there was also the implementation of the Marshall Plan and the development of the European Economic Community, from which the European Union would develop (and largely surpass the alternative European Free Trade Association). The eastern bloc's equivalent was the Council for Mutual Economic Assistance (Comecon). It is not unfair to claim that origins of the European Union lie initially in the post-WWII environment and the establishment of the European Coal and Steel Community (ECSC), which operated from 1952-2002. This was established between Belgium, France, West Germany, Italy, the Netherlands and Luxembourg, and has an interesting precursor with Neutral Moresnet. The importance of the ECSC cannot be understated, as its explicit aim (expressed by the French foreign minister, Robert Schuman) was to prevent war between France and Germany in particular and to promote the idea of a united Europe. Following the success of the European Coal and Steel Community (ECSC), an incremental succession of multilateral agreements were put in place that gradually empowered supernational bodies. The Treaty of Rome in 1957, established a customs union and the European Economic Community. The Maastricht Treaty of 1992 established the "three pillars" (European Communities for economic, social, and environmental policy; the Common Foreign and Security Policy, and Police and Judicial Co-operation in Criminal Matters. The Maastricht Treaty provided for the introduction of the Euro and the Schengen Area, and the Lisbon Agreement of 2007 strengthened the European Parliament, established the Charter of Fundamental Rights as a legally binding document, and gave member states the explicit legal right to leave the EU. Today the European Union is a significant subset of Europe; it does not include Norway, Switzerland, most of the former Yugoslavia, Albania, Ukraine, Belorussia, Russia. It does however, account for around 7.3% of the world population, and 24.6% of the global GDP. The UK was not a signatory of the three original treaties, and applications to join the European Community in the 1960s were vetoed by France, which only accepted the UK's applications after de Gaulle had resigned, who expressed strong opposition to the UK's membership. A referendum was held to leave the European Community under the Wilson government in 1975, which was defeated with 67.2% in favour of staying. It was not until 1990 that the UK joined the European Exchange Rate Mechanism (ERM). Two years later on "Black Wednesday" the UK government was forced to withdraw the pound sterling from the European Exchange Rate Mechanism (ERM) as was unable to keep the pound above its agreed lower limit, following a sell-off of the pound. Historic opponents to British integration into Europe included leaders of the Labour Party (Hugh Gaitskell, Denis Healey, Barbara Castle, Michael Foot, Tony Benn), as well as Conservatives and reactionaries (e.g., Victor Montagu, Enoch Powell, Sir Robin Williams), covering far-left anti-capitalist perspectives and far-right nationalist-racist perspectives. Tony Benn, for example, made the point that his opposition to the EU was not founded on any sort of xenophobia, he was opposed to building a capitalist empire. In stark contrast Montagu stated "those of us in Britain who oppose the Common Market don’t want to subject ourselves to a lot of frogs and huns". The leaders of the contemporary move of the UK away from EU are primarily the relatively small UKIP. This party was essentially a small, centrist group, but gained prominence several years after Nigel Farage took over the party in 2006, shifting it to the far-right, and achieving breakthroughs in the 2013 local elections, 2014 European elections, and 2015 general election. In addition to the UKIP a strong Euroskeptic wing became prominent in the Conservative Party grew, especially around Boris Johnson. The Conservative Party 2015 general election manifesto committed the party to a referendum on EU membership, which was held in June 2016 with 51.89% voting to "Leave" and 48.11% voting to "Remain". The strongest demographic differences were education (more educated voted to Remain), age (older people tended to vote to Leave), and ethnicity (ethnic populations voted to Remain). This combination constituted a large majority of the difference between Leave and Remain. The official policies of the Greens, Labour, and the Liberal-Democrats was for Remain (although Labour's support was lukewarm at best), whilst the UKIP supported leave, and the Conservatives were Neutral. There is strong evidence that a number of people voted against perceived elitism rather than knowledge (e.g., Google searches). Following the referendum, there was a push for Scotland to have a second independence referendum, and Spain initiated a debate over the governance of Gibraltar (both of which strongly voted to Remain). A petition was initiated and signed by four million for a second referendum, and there concerns of lack of youth involvement. There has been notable campaign irregularities and electoral commission fines, with continuing investigations. These are sufficiently serious that some MPs are now arguing for a second referendum. The Good Friday agreement has a high degree of incompatibility with Brexit and a continuing run of opinion polls suggest "Bregret". Finally, leaked documents from the UK government indicate that no matter which model or agreement is reached with Brexit, there is expected long-term effects including a loss of real GDP per capita (2-8% for 15 years under all scenarios). It is well recognised that the United States under Donald Trump strongly supported Brexit publically. There is also strong evidence that Russia under Putin saw it to their advantage and backed social media campaigns for Brexit - after all, the EU issued criticism and sanction to Russia over Crimea's annexation. Breaking up an increasingly independent European Union, of course, in the strategic interest of both the United States and Russia who would prefer to have western and eastern Europe under their respective spheres of influence, and one is tempted to draw analogies between the annexation of the Sudetenland and the partition of Poland. As with the UK, there are major anti-EU political movements throughout Europe. Like in the UK, a number come from a far-left political orientation which sees the European Union only in terms of being a capitalist enterprise (overlooking its social democratic aspects, lower levels of income inequality etc). Far more prominent is ethno-nationalist perspectives. The major anti-EU groups in Europe include; in Germany (Alternative for Germany, nationalist-conservative), France (National Front, nationalist-conservative), the Netherlands (Party for Freedom, nationalist-conservative), Italy (The Five Star Movement, soft anti-EU, anti-elitist), Austria (Freedom Party of Austria, soft, nationalist-conservative), Hungary (Fidesz, nationalist-conservative, Jobbik, extreme-right), Greece (Golden Dawn, extreme-right, Communist Party, extreme-left), Iceland (Independence Party, liberal-conservative, Progressive Party, centre-right, populist), Moldova (Socialists, Communists, left and far-left), Norway (all major parties oppose EU integration despite close referenda), Russia (all major parties), Switzerland (Swiss People's Party, nationalist-conservative), Sweden (Sweden Democrats, far-right), Denmark (Danish People's Party, nationalist-conservative), Turkey (Nationalist Movement Party, nationalist-conservative). It seems that many of these organisations do not realise that the time of the great European imperial powers has long gone. Whilst the ethnocentric and nationalist rejection of the European Union is the popular vehicle used to drive an anti-EU sentiment, especially with the refugee crisis from Syria, behind that there is also conservative authoritarians where are particularly opposed to the human rights requirements that the EU established, and minimum standards for labour laws. Notably, as the crisis in Syria diminishes, the pressures from the rapid refugee influx will inevitably decline. Attention will then be drawn to the opposition that the anti-EU groups have to civil rights and labour rights; under these circumstances, their existing degree of popularity will diminish. Under such circumstances, inevitably, it is opportune to look beyond 'Staatenverbund', the German neologism now established in case law to describe the EU. This represents a level of governance in which nation-states act in confederation but retain their own sovereignty. The institutions of the European Union may not issue standards unless they are authorised to do so by the EU treaties. It was always especially difficult in Europe with due to political history, multi-lingual regions, relative diversity in economic development, and importantly, sovereign state military. Nevertheless, the EU has achieved a free movement of people, goods, services, and capital within an internal market with consistent legislation through treaties. Among international power-blocs it has the highest values for civil rights and social democracy. Further possible steps are possible for greater integration. Firstly a second EU referendum in the UK must be held. It is clear that electoral fraud influenced the outcome, and that many voters had either been deceived or simply didn't know what they were voting for. Democracy only functions effectively when voters make an informed deliberation on their choices. This was certainly not the case here. Whilst the deadline for Brexit approaches, many seem to wish that the entire problem will go away - it simply won't. March 2019 is a hard break deadline; the UK is like a person who has locked their doors and windows, set fire to their house, and now is calling out for help - and none is forthcoming. A second step would be further economic development and adoption of the Euro in eastern Europe, and the UK upon readmission, and Sweden. Finally, the EU is hampered by its lack of an independent military and dependence on NATO. A Strengthening of Common Foreign and Security Policy and independence from NATO will provide the steps towards a truly independent Europe. This said, much depends on future US elections. At the moment most Europeans are prepared to weather the storm of expected belligerence from Russia, and the unpredictable opposition from Donald Trump. However, the re-election of an anti-EU president in the US will require the EU to look elsewhere for a strategic alliance, as it will be necessary for them to do so. It should not be surprising that most likely candidate is China. Commenting on this Story will be automatically closed on September 29, 2018. This is what a no-deal Brexit will look like. 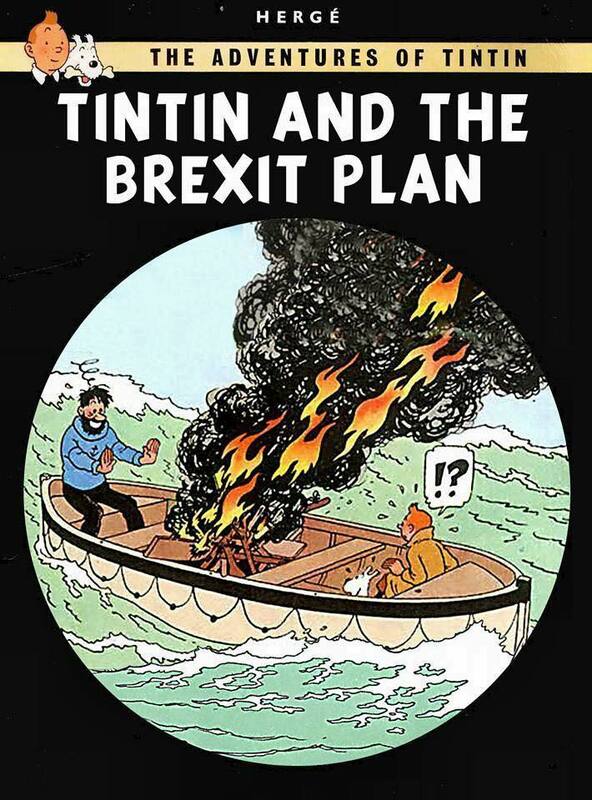 "Ministers have drawn up plans to send in the army to deliver food, medicines and fuel in the event of shortages if Britain crashes out of the EU without a deal." What happened in Greece happened because they do not have sovereign control of their own currency. They are on the Euro. The currency that the Greek government spends and collects taxes in is a foreign currency. What happened in Greece cannot happen here. The U. S. has a sovereign currency system. We issue our own money and taxes are paid in our own money and the bulk of the debt is owed in our own currency. Greece is not a sovereign nation economically. It stands in relation to the EU the way that Utah relates to the federal government. Utah doesn't have its own money. Greece and Utah can go bankrupt. America can't. As per the article, Brexit was funded by right-wing capitalists who objected to EU labour and human rights laws and appealed to working class and elderly people's fears of immigrants and opposition to liberal elites, specially in the face of declining wages. And now the attack on human rights legislation begins.